While the tour was expensive it was excellent. Very informative. We really got to see Cochin. Had a great time. Backwater Cruise: This was our second tour with Lijo, completely different from the first and a great success again. He seems to know every bird, flower, plant, animal, about navigational currents. He is sensitive to client needs, ensuring that dietary restrictions were considered. He offered a short trip to a site along the route which was interesting and offered a change. He pointed out activities along the shore. He is passionate about his work. Great guide! Nice place to go but it was not what we booked which was disappointing. Our guide who was not Lijo but he was fine. We did not get a houseboat. This was an excellent tour. Lijo is very knowledgeable about the past and present of Cochin, and he took us to many interesting sights in a very comfortable, air-conditioned van. He cheerfully answered our many questions, and made sure we were comfortable. Of note, he took us to a women's collective shop, where we bought good quality, reasonably priced souvenirs. We also visited a Jewish temple and he knew the whole history of Jews in Cochin. We learned a lot! Book Lijo! What a wonderful tour. Lijo was wonderful. He knew more about the Jewish Heritage of Cochin than I thought was possible. He took us all around Cochin and was pleasant and fun to be with. I would highly recommend this tour to anyone!!!!! Not your tipical tour here in Cochin. It was so much more. Lijo was fantastic, helpful, knowledgeable, and flexible with our itinerary. His driver was very kind and accommodating. Fabulous tour by an even more fabulous guide. Lijo is a professional from A to Z. He was well-informed, energic, flexible and helpful. We had a lovely day with him and felt we had a sound understanding of both Cochine, in general, and its Jewish heritage, in particular. An amazing place! We highly, highly recommend Lijo. Lijo did a great job for us. He met us promptly when we disembarked and put us in a very clean van with great AC. The driver was very attentive and knew how to negotiate the roads of Cochin. Lijo was very informative and did not intrude or force himself into discussions when we were having discussions among the group. He took us to places where we could see the local culture in action. We all highly recommend him. So much better than an excursion with the cruise line! And cheaper! Lijo met us at the ship, took us to all the sights worth seeing, while avoiding the obvious tourist traps. We were very satisfied with his tour. Lijo was wonderful, he is very knowledgeable and showed us all of the interesting sites. He met us on time with an air conditioned car with a driver. We had a wonderful lunch at a seafood Restaurent. On the water. I highly recommend this tour and Lijo..
Lijo is an excellent guide. I would use him again without hesitation and recommend him to others with the highest compliments! This tour made Cochin a very special place for us. Our tour guide, Lijo, was excellent. His knowledge of Judaism in India was particularly impressive. He is well spoken and extremely personable. My husband and I will look back at this tour as a highlight of our trip. We enjoyed the entire day and encourage others to have the experience. Lijo is an excellent guide and he fulfilled all of our excursion wants and needs. We especially enjoyed the Elephant festival and he took us there when it was not too crowded. I gave a 4 * instead of a 5 * rating because he was constantly on his cell phone during our tour making business arrangements that had nothing to do with our tour. It was annoying, and took away from his full attention for our group. TOUR GUIDE RESPONSE: Yes I know this was terrible of me to use my phone, there was a particular case that day that needed attention but I will not do that again in the future. We cannot praise Lijo enough! He was thoroughly knowledgable and professional! 5 stars all the way! The place he chose for lunch was incredible-a gem in the middle of the backwaters of Cochin! The Cochin tour consisted mainly of a drive from the cruise ship to the lake for a relaxing houseboat tour with a delicious lunch. There were a few churches, temples and markets along the way, but being Sunday, not everything was open. The guide was very informative and helpful. As this was the first time I visited India, this was a wonderful introduction to the country. What a wonderful day! 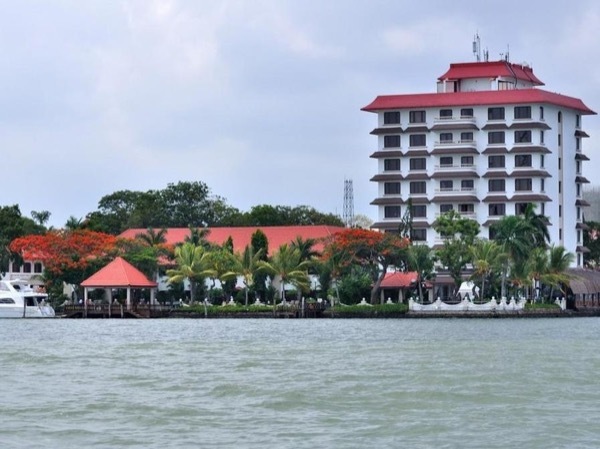 Lijo provided an interesting and comfortable day in beautiful Cochin. I would highly recommend this tour to anyone wanting to see the local life. He arrived late. We told him that we wanted to go to the Paradesi Synogogue and Jew Street in Jew Town. The 4 of us felt that he did not want to take us there although it was part of our itinerary. He insisted that we go to a Hindu Temple where there was an elephant festival. We went to the temple and instead of having lunch at a private home, he took us to a restaurant of a friend on the beach. We did not get what we paid for. I would not recommend him to my friends. TOURSBYLOCALS RESPONSE: We’ve discussed this situation at length with both the guide and Mr. Greenberg. We’ve issued an appropriate compensation for Mr Greenberg's dissatisfaction. This was one of 3 tours we booked through Tours by Locals on our 41 day cruise from Singapore to Venice. This was the best. Lijo is a nice person, and a very good guide. We especially enjoyed the backwater boat ride. We had a very good lunch at an attractive small waterfront seafood restaurant. I would like to thank you and the driver for the fabulous Jewish Tour Of Cochin which both Judi and I will never forget.The Jewish personalities that you introduced us to who you knew personally so well as well as the visits to the synagogues were amazing. The visit to the synagogue and Jewish Cemetery in Jew Town was very nostalgic as well as our long walk down Jew Street which was about 20 minutes away from Jew Town. I would have no hesitation in recommending your tour. TOUR GUIDE RESPONSE: Hi Madam, thank you for the great feedback. I am so passionate about sharing my love of kochi and her secrets. You both were great company and we all had fun that day. Our tour with Lijo was a wunderful experience. Besides discovering Kerala's backwater, we got the unique chance to join a Hindu festival and other religious spots. Jo is very friendly & open-minded guide with a very good historic background and knowledge. He offered us an individual sightseeing tour without being typical touristy. Although we only had one day to visit this part of India, we were deeply impressed by this country, its people, different religions & excellent food. A tour with Jo is a must. TOUR GUIDE RESPONSE: hi,I read your comments again and again.Thank you so much.I hope all is well. The tour guide Lijo and Sunil were friendly without being intrusive. they were courteous and took good care of us. They had the knowledge and the communication skills and were full of information. We will go back again with the same team. TOUR GUIDE RESPONSE: Thanks so much! Loved your company and glad you enjoyed the day. TOUR GUIDE RESPONSE: Thank you sir, i have no words to express my happiness and feelings towards your review, Conway my regards to all from my bottom of heart.